Furniture Store, Mooresville, NC | Gibson Brothers Furniture Inc. Furniture Store, Mooresville, NC | Gibson Brothers Furniture Inc.
For over 60 years, our family-owned and operated furniture store has been helping people throughout Mooresville furnish their homes. You want the furniture in your home to be functional, beautiful, and for it to add to the overall design scheme of whatever room it’s in. Whether you’re in the midst of redoing your living room, giving your dining room an update, or adding a few new pieces to your bedroom, you need to come and visit our furniture store at Gibson Brothers Furniture Inc. Located in downtown Mooresville, North Carolina, we have a selection that will astound you! From chairs and tables to loveseats and dressers, we know we have exactly what you need for your home. As you browse our selection, one of our professionals will give you as much or as little help as you want so you end up making a purchase you’re more than happy with. For over 60 years, our family-owned and operated furniture store has been helping people throughout the Mooresville area furnish their homes. Our quality, service, and value have enabled us to make a strong mark on our local community, and we look forward to many, many more years of operation in the furniture industry. While it may be easy to buy all of your furniture at a big-box store, you really can’t beat the quality of our furniture pieces, the level of service we provide, and the way we customize every customer’s shopping experience according to their needs. 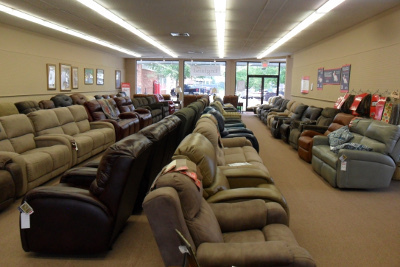 Stop by our furniture store today or give us a call if you have any questions about our hours, selection, or prices.